Thermometrics manufactures a full line of standard and custom weld pad RTD's. The weld pad (tube skin) termination allows a temperature sensor to be welded directly onto piping or other metal surfaces to sense the surface temperature. Weld pads are most commonly used in fired heater tubes, refinery heater tubes, boilers and furnaces in refineries, and industrial boilers. However, they can be used in virtually any application requiring surface temperature measurement. •Replaceable element design simplifies RTD replacement. •To replace a faulty element, you simply remove the head cover, disconnect the leads and remove the element. You then insert the new element and reconnect the leads. Your process is up and running in minutes. The samples shown are 100 ohm RTD sensors in a 4-wire, Flex Armor and Teflon insulated configuration. This provides an operating temperature range of -50 to 250oC. Fiberglass insulated wire is also available.The outside diameter of the sheath is .250 O.D. The length of the tip, sheath, transition and lead wire are specified by the customer to suit the application. The lead wire can be supplied as bare wire, terminated with plugs, jacks, spade lugs, or junction boxes. The temperature sensor can be configured to your dimensional requirements or it may be purchased off the shelf with a 1.0" by 1.0" weld pad, (.125" thickness), 4" sheath length and 36" of stainless steel protected fiberglass lead wires. 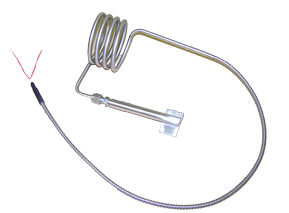 These temperature sensors configurations can be manufactured as RTD's, Thermistors, Thermocouples.Common types include; 100, 500 and 1000 ohm RTD temperature sensors. We also manufacture customer specified temperature elements, including the Balco, Copper and Nickel temperature coefficients. 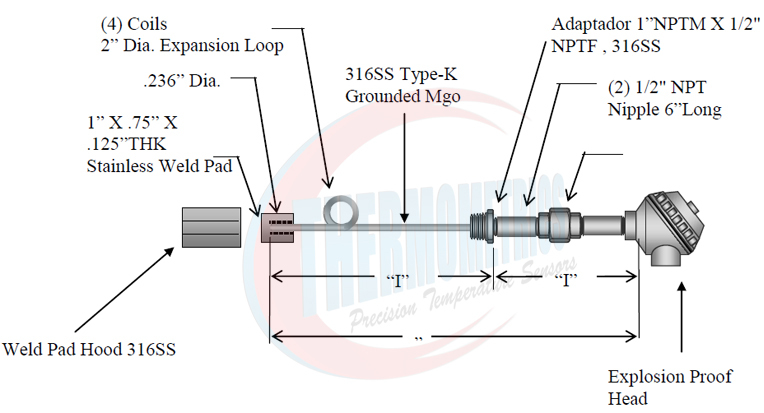 MIL-STD temperature curves are also rountinely manufactured by Thermometrics Corporation.